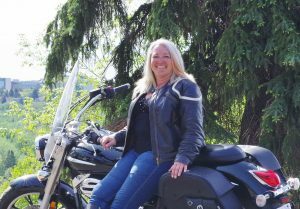 Debbi Serafinchon wants to be able to experience riding for many years to come and got involved with AMSS because she saw the importance of their work to keep us all safe on the road. She has only been riding for 3 years but has racked up over 40,000kms. She loves her windshield time and the ability that riding has to put a smile on her face. She often wonders why she waited so long to experience this incredible feeling of ferociousness. She ventured down the west coast from Edmonton along Interstate 101 to Los Anglos this summer and driving across the Golden Gate Bridge is a feeling she’ll never be able to replicate. Not only is Debbi the Secretary for AMSS, she also handles our event coordination and can be reached at events@ab-amss.org if you would like AMSS to attend your event.